Can be used to replace the USI-7390 alarm, uses same connector plug. The USI Electric MCN108 Hardwired Carbon Monoxide and Natural Gas Smart Alarm is a 2-in-1 device that provides double the protection with a single installation. This dual-sensing alarm protects against two deadly household threats: carbon monoxide and natural gas (or methane). Perfect for new or replacement installations, the 120-volt AC/DC hardwired alarm is suitable for houses, apartments and mobile homes. Auto sensitivity calibration provides superior nuisance alarm protection and creates consistency in alarm sensitivity. This alarm has additional automatic features including a self-diagnostics check to ensure proper operation, a sensitivity adjustment for changes in temperature or humidity and an end-of-service life warning that sounds when it's time to replace the battery. The 9-volt alkaline battery (included) continues protection in the event of a power outage. This alarm features a quick activation pull-tab and a front-loading battery drawer for replacement without removing the alarm from the bracket. Mount the bracket to any standard wiring junction box and use the large mounting base to cover imperfections in drywall. The plastic dust cover protects the alarm from debris and (2) tamper-resistant locks prevent unwanted alarm or battery removal. For maximum protection, install an alarm inside every bedroom, outside every sleeping area and on all levels of the dwelling. The USI Electric MCN108 Hardwired Carbon Monoxide and Natural Gas Smart Alarm comes with a 7 year limited warranty. These units worked perfectly and were easy to install. This is a very good product. My previous alarm lasted 10 years and this is the newer version of this. Easy to plug in and works great so far. Order placed and I had them installed within a week. These replaced two old ones that were no longer working. Less than 10 minutes to install. Highly recommend Universal Security Store. Had to replace older models hope these last longer. Purchased replacement alarms. Easy to install. Customer service from Michele was amazing! Purchase md replacement alarms. Easy to install. Customer service from Michele was amazing! Warranty specify 7year. Never lasts more tan five years. We're sorry to hear that Cataldo. The MCN108 does include a 7 year limited warranty. If your combo alarm didn't make it the seven year mark, we'd be happy to speak with you @ 847-701-3013. Let's get the situation resolved and keep you safe! 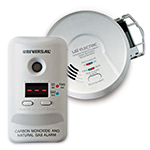 Ordered a 2-in-1 Carbon Monoxide and natural gas alarm from USI ELECTRIC. Placed order on line and received it promptly. This is the second time I have placed an order with USI and I'm very satisfied with their service. Would highly recommend them to friends. Ordered a 2-in1 carbon Monoxide and natural gas alarm from USI ELECTRIC. Placed order on line and received it promptly. This is the second time I have placed an order with USI and I'm very satisfied with their service. Would highly recommend them to friends. I ordered replacement units directly from USI as the older ones, while still functional, were dated 2003. I called to place order, was treated well, and the products were well priced and shipped timely and free. I recommend this company! I received exceptional assistance and service from Michele Metcalf in Customer Service and Jenna McLaughlin with the Universal Security Store. Gas detectors seem to be working well! We purchased this model MCN108 because we were told it was the correct replacement for an older model CD-9385. However, even with changing to the new universal bracket, we found that the alarm does not fit as snugly against the ceiling as the old model did. Easy to install. It is great! no issues....simple replacement. thanks, Larry. We built a new home and the builder installed Universal products. After 7 years both stopped working so I got on Amazon and ordered two replacements. Not long after, one stopped working and when I checked the manufacturing date, it was 5 years old already. Order direct from Universal and avoid additional costs! Quick delivery and easy install. Easy to install and working well. I like the addition of a back up battery. Great replacement for my Model CD-9485. Perfect fit. Very pleased with customer service. Was a perfect fit for the older model that had to be replaced. this product was a good value and was perfectly suited to my needs. Easy installation and work perfectly in tests. Needed replacement CO detectors for existing USI CO monitors 8 years old. Nice to see natural gas detection functionality is now integrated into a single unit. Good product. I order four at a time as I am in real estate and give them to my clients. They really appreciate it. Thank you. I can not find these in any local store and so I am glad I have found a store I can rely on to replace my carbon monoxide detectors. A quick fix and lasts a long time. This alarm was purchased to replace a similar alarm that no longer worked. It installed easily and there were no problems with the set up procedure which was well described in the product info. After communicating on the online chat, I was advised the type product I needed. It arrived in a timely manner & was a perfect solution to my problem. This item was installed with great ease due to the compatible nature of the product. The CO detector is more current compared to the old, expired version obtained 7.5 years ago. 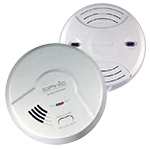 We also ordered the smoke detectors and look forward to ensuring the safety of our family. Shipment was in a timely fashion. Great company to work with. They kept me updated on when product would be delivered. Product worked perfect. I replaced my CO meter with this new device. It shipped quickly, was well-packaged and was incredibly easy to install. In all, a great transaction and nice device. The product fit perfectly to replace the previous model that it replaced. Works great, I have this throughout the house smoke detectors and carbon monoxide. Unfortunately my tenant took this one with them when they left or broke it ect, this was the perfect replacement..
Q: WHAT LEVELS (PPM) OF CARBON MONOXIDE CAUSE AN ALARM? Q: IS CARBON MONOXIDE HEAVIER THAN AIR? A: Carbon monoxide is not heavier than air. A carbon monoxide alarm should be installed in a location where the alarm will stay clean, and out of the way of children or pets. Refer to the user's manual for specific installation requirements. Q: WHERE SHOULD I INSTALL MY CARBON MONOXIDE ALARMS? A: It is very important to install a carbon monoxide alarm outside each separate sleeping area, and for maximum protection, install one in every bedroom. 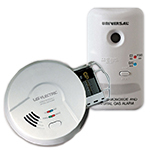 Many states now require installation of a carbon monoxide alarm inside each bedroom. For added protection, placement of an additional carbon monoxide alarm at least 15-20 feet away from the furnace or fuel burning heat sources is recommended. Install carbon monoxide alarms a minimum of 10 feet from sources of humidity like bathrooms and showers. In multiple-story dwellings, install one carbon monoxide alarm on every level. If you have a basement, install a carbon monoxide alarm at the top of the basement stairs, and in each separate sleeping area. Q: WHAT AREAS SHOULD I AVOID INSTALLATION OF A CARBON MONOXIDE ALARM? A: Do not install carbon monoxide alarms in garages, kitchens, furnace rooms, or in any extremely dusty, dirty, humid, or greasy areas. Do not install alarms in direct sunlight, or areas subjected to temperature extremes. These areas include unconditioned crawl spaces, unfinished attics, un-insulated or poorly insulated ceilings, and porches. Carbon monoxide alarms should not be installed in outlets covered by curtains, heavy furniture or other obstructions. Do not install in turbulent air-near ceiling fans, heat vents, air conditioners, fresh air returns, or open windows. Blowing air may prevent carbon monoxide from reaching the CO sensors.